The sounds coming out of Mosque's loudspeakers to 'tring' sounds of Rickshawala's bell, from traffic jams to the aroma of food coming out of every corner, that is Old Delhi for me. Old Delhi is a walled that was once known as Shahjahanabad in 1638 when Shah Jahan decided to shift the Mughal capital from Agra. Old Delhi is the perfect combination of Food, Architecture, History with the touch of the real essence of Delhi. My walk started from Chawri Bazar Metro station, Gate number 4. And as I walked out of the station, all I noticed was the mad hustle bustle of this area. I went there in October so you know, I had to try this so hyped and famous dessert, 'Daulat ki chaat'. 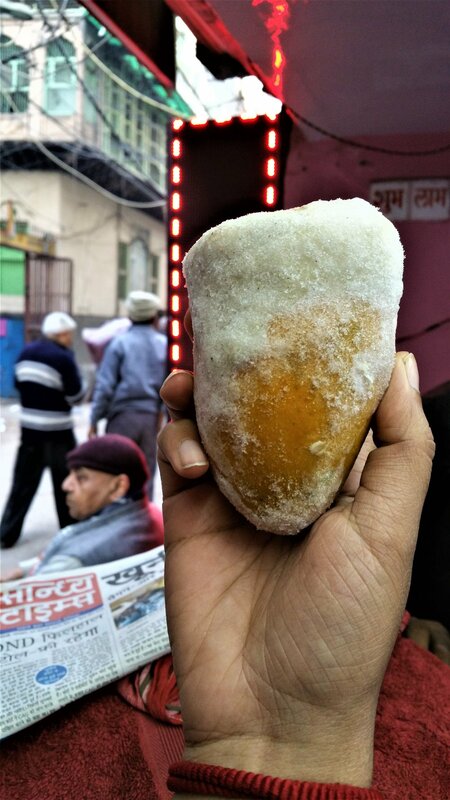 This is something that you will only find in streets of Old Delhi especially in winters. As I walked through the lanes of Old Delhi, I noticed the architecture that is as old as 100 years. Beautiful big doors, big latches on them, blue colored walls and multiple windows on one wall. Like any ancient house. After walking by some lanes, I stumbled at this shop 'Kuremal's Kulfi'. This shop is almost 100 years old and they boast about making kulfis (ice creams) with only natural fruits and flavor. The kulfis were frozen inside the real fruits, and that blew my mind as I have not had anything like this before. 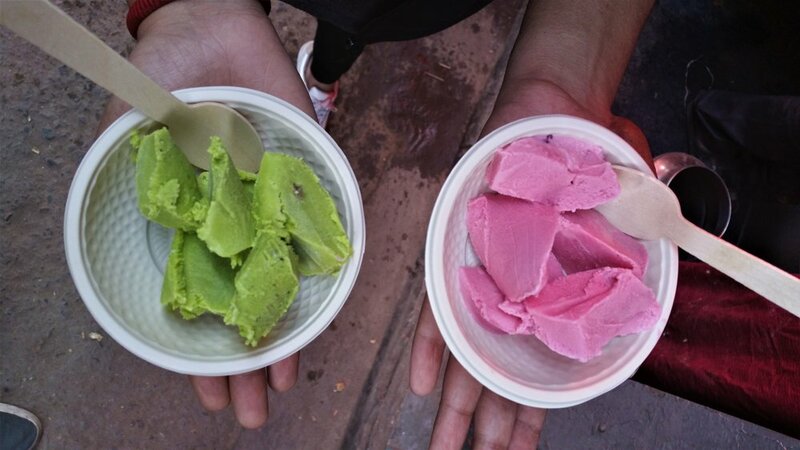 After having these amazing treats, I walked towards Fatehpuri Masjid in Chandni Chowk. Looking at the amazing crowded market with vendors standing at each side of the road, I could imagine the daily traffic that people talk about. While strolling around, I found this Siddique family’s kheer shop in Lal kuan. 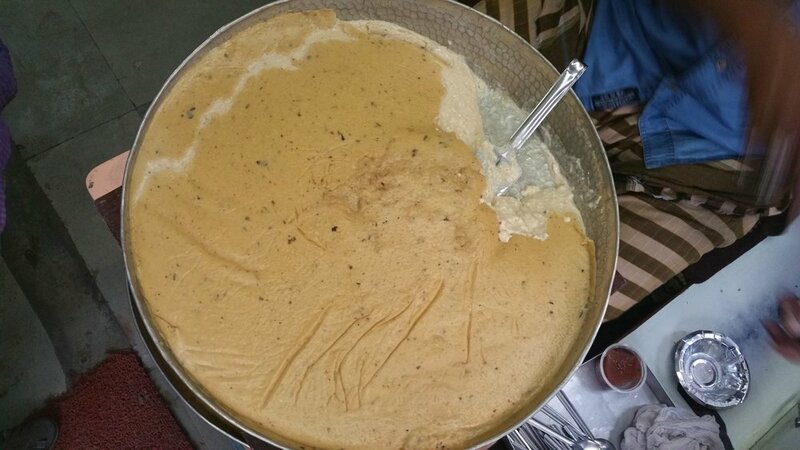 Famously known as Bade miyan ki kheer. Every hype you have ever heard about this kheer shop is absolutely true. You must go here to have the best kheer of your life. After having this kheer and chit-chatting with the owner for a while, I walked towards Fatehpuri Masjid where I found the famous Khan Omelette Corner. The guy was setting his shop up when I reached so for a while he told me the humble story of how many people visit the shop daily while preparing the Omelette. Couldn't resist but click the prep too as it looked too delicious! And all that I hogged on while passing from Fatehpuri Masjid to Jama Masjid at Ashok Chaat Corner, Rabri faludas from a roadside vendor, Kulley ki chaat (fruit chaat) and Fruit Sandwich at Jain Coffeehouse. This coffee house's coffee machine is 60 years old hence being a coffee lover, i had to try this place. 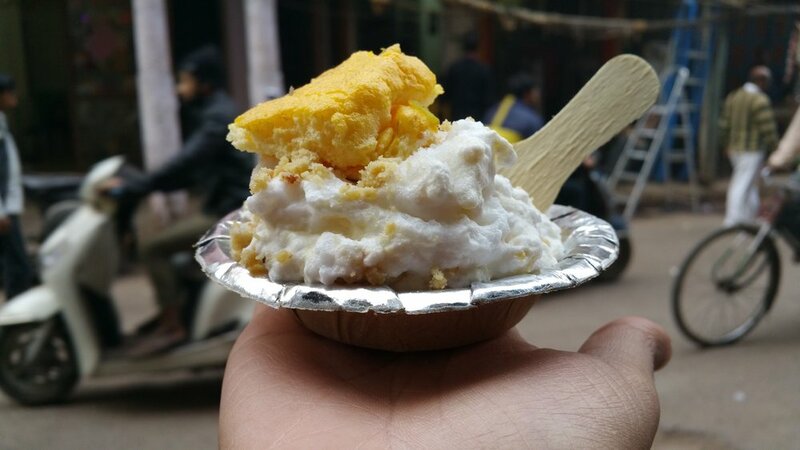 And finally, after so much munching in between, I reached Jama Masjid, to have the last dessert that has been my favorite for all these years. Here, I won't disclose the name, but if you have been here anywhere close to Jama Masjid, you will know what I am talking about. Here are some pictures of the dessert I am talking about. So this is pretty much about my fulfilling day, literally filling my stomach and soul. Old Delhi, speacially during Ramzan is nothing less than heaven for food lovers, photographers, and explorers. Its like a mini fair every day. How many places you have already tried and how many are you going to try now? What are your favorite points that are not mentioned here? Let us know everything in the comments below. We would love to know more about this place. Thank you for reading. You can follow us on instagram and facebook here. Cheers!